Happy Saturday! Hope your week went well. I’ve been battling a flu/cold all week, so I’m going to skip waxing poetically and get right to the point. Today’s post features a few time sensitive events closing on Tuesday, February 28, 2017. First up is Park Place Home Decor Black Leather Chaise, Red Heart Garland Wall Decor, Gray Shag Diamonds Area Rug, Leafy Green Table Plant and French Walnut Round Accent Side Table exclusive for the Swank Event ending 2/28/17. The theme for February was truly, madly, deeply; which inspired the darker boudoir. Next is Brook Hill Livings recent release for the February round of The Crossroads Event, the Wagner Chair in Ebony and Spotlight, closing 2/28/17. I also used the Faun Chandelier in Midnight, available for sale at the main store. 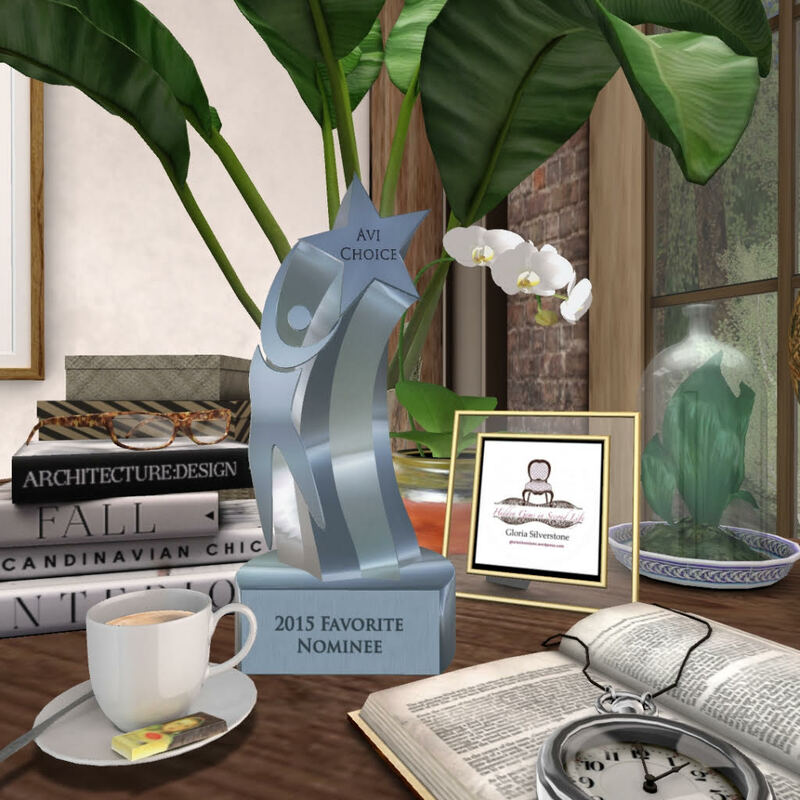 The remaining decor items are from a new to me subscriber monthly event called Deco(c)rate. On the 8th of every month a mystery box with 15 semi-exclusive items from top H&G designers are delivered to your inventory, if you reserved your cart for $1,500L before the 7th. Afterward the price doubles to $3,000L. In today’s post, I used Mudhoney Ginny Bed, Second Spaces Mood Lighting Candles, Cheeky Pea Forgotten Places Fireplace, Hextraordinary Antique Cherub Lamp, Stockholm & Lima The Lovers Trail and Serenity Style All for Love Suitcase. There are a number of other items that I hope to showcase before the new March boxes arrive. Personally, I’m still a little on the fence about a subscription event, time will tell if it’s for me. (I do love my bargains :-)) Lastly, I mentioned in my last blog post I wanted to spotlight more gifts from the Love Me…Love Me Not Hunt (ending 2/28) and Gloria is sporting the Facepalm Just Love red silk sleep shirt in standard sizing and mesh compatible. Gloria’s golden locks are HoneyAna, the new group gift from Truth Hair ($350L join fee). Hope you enjoyed the post, I’ve got couple more planned for the weekend….stay tuned! This week has been unseasonably warm in my area. It’s normally in the mid-50’s/60’s and rains during the month of March. The weekend forecast has high of 75 degrees, which is awesome. Spring is upon us and it’s time for me to change my sim over from snowy winter to spring landscaping. In the meantime, I styled the Trompe Loeil Attic Skybox with Finishing Touches new release, Floral Mint Collection available for 50% off at The Perfect Ten until March 15, 2015. Finishing Touches Floral Mint Collection includes a twin trundle-bed in soft green floral, mint rugs, matching rocking chair, white chest, standing birdcage with ivy, wall lanterns, and double hanging wall picture frames. I accessorize the soft, sweet, girly room with spring floral close-up photos, butterfly and bee wall art, Second Spaces Elizabeth Guest Room Shelf, Rosalie Secretary Desk, and Beverly Quilt Rack. For some added sweetness, I also included Sway’s Cupcake Bunny, Flower and Butterfly, both gathca items at the current round of The Arcade ($50L a play). Hope you enjoyed the post and are inspired to refresh your space for springtime!